Editor's note: If you do not approve of the Governor's policies, here is your best chance to show your disapproval by registering yourself at the above link. Editor's note: The following letters were received by Mary Hallick from her grandson, Chad Ramskugler, who is serving in the military in Iraq. These letters give a more objective viewpoint of what is going on in Iraq as compared to the daily missives of bad news given to us by the news media. 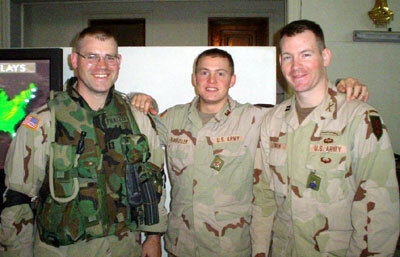 Here's a picture of my roommates and me...we wish you all a great Memorial Day! Our sector has been very quiet the last month and I want you to know part of our success comes from the tremendous support you send from home. Every prayer, word of encouragement, and thought gives us the extra energy to go out and "make it happen." We've been doing so much great work...repairing the largest bridge over the Tigris River in our province, repairing the liquid petroleum gas lines from Bayji that feed electrical generators in Baghdad, surveying 40 small rural towns for new drinking water wells, and having weekly "town hall" assemblies where Iraqis begin to experience what democracy is all about. Tanks for everything you've been doing for us...and don't ever be discouraged by the negative headlines! Hey everyone! I couldn't miss this chance to wish you all a great weekend and fill you in on the lastest news from the newly sovereign nation of Iraq. The picture is from last week -- I made these "Partnership" signs to hang at the entrance of all our base camps. Some call it propaganda, but I call it art. Right now I am in the provincial governor's building and I just finished meeting a few of the public works guys that will be in charge of the infrstructure improvements this year. 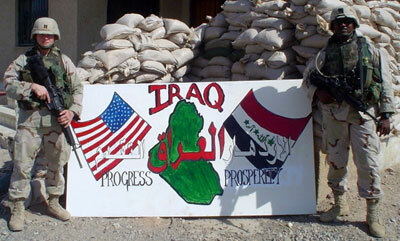 Its a lot of fun spending time with the Iraqis -- they are gracious hosts and love to have conversation. Several of the guys I meet with, like Dr. Ali, Mr Rahkman, and Mr Hamman enjoy telling stories about where they grew up and how their children are doing. The deputy governor General Abdullah has a son in the sixth grade that runs around to the point of annoyance always wanting to know whats in my bag or if he can have my sunglasses. Tonight we are going to the division headquarters to celebrate the 4th of July -- they have a beautiful palace overlooking the Tigris river from where we'll watch a massive firworks show and feast on some BBQ. No beer, so you'll have to drink one (or more) for me! Oh, one more thing. I'm hanging photos from home above my desk, so feel free to email me a few! Just a note to let everyone know that the Minonk 4th of July Committee truly appreciates all of the support of the many individuals and businesses that have assisted us as we put together the Sesquicentennial and 4th of July Celebrations this year. A separate note to you lists all of the sponsors we had this year and if we have missed putting your name on the list please let me know and I can correct that oversight. Let me take this time to mention their names: Russell and Lanna Ruestman, Jason Buchanan, Bruce Tjaden, Billie McCormick, Pat Copp, Scott and Mindy Johnson, Stephanie and Joe Fuchs, Trent Smith, Ron Redenius, Dave Uphoff, Nancy Reiter, Jari Lynn Oncken, Bob and Kathy Jackson, Jack Jochums, Amy Stimpert, Tracy and Dave Harsted, Corey Ruestman, and myself, Cathy McKay. If you should see these folks please let them know how much you appreciated their efforts on your behalf, they don't hear it nearly often enough. THANK YOU!!! Another group of individuals that need a THANK YOU are the city employees who assist us tremendously with all of the many tasks that they perform - please let them receive your thanks as well. The last group that deserves a big thank you is the many volunteers that the committee relies on to assist us as we attempt to organize each event. These events would not be possible without all of your help - thank you as well. As I told you in person great job on the sesquicentennial celebration. Everything was a success. I am very pleased that we had a memorable occasion like this that I could share with my family. In other words there was enough for the young, old and middle age. Good time by all. You and the commitee deserve a round of applause. A pat on the back also for the history of Minonk slideshow. Thanks again for the hard work and outstanding success. This is Kristina Oncken. I currently work for The Leukemia and Lymphoma Society in Normal. I am currently organizing our annual Light The Night Walks for Bloomington, Champaign, and Peoria. The Light The Night Walk is an annual evening walk and fundraiser for The Leukemia and Lymphoma Society. The walk begins at nightfall, and walkers carry illuminated balloons. Each balloon is a beacon of hope for the millions of people affected by cancer. Light The Night is a place for friends and families to come together in celebration and commemoration of lives that have been touched by cancer. The event has a festival-like atmosphere, with participants enjoying music, food, and fun activities. I am currently recruiting teams and volunteers to participate in the walk. I was wondering if it would be possible to put information about the walk on the Minonk Talk website? Maybe our logo and a direct link to the Light The Night website? I would like to thank everyone who attended or supported our Bingo Night for the Alzheimer's Memory Walk. Our team (Anne's Unforgettables) raised over $2000.00 with that event and I hope to continue to raise more by other fundraisers in the future. I think everyone had a lot of fun and I have had several people ask me if we would do it again next year. Our walk is Oct. 2nd in Normal. If anyone wants to make a donation or is interested in forming your own team please call me. Donation can be mailed to me and checks should be made out to "Alzheimer's Association". I just wanted to let everyone know that 6 balloons have been found from the 4th of July balloon lift. Here is a list of whose balloons have been found and where they were found. Just got to see me again as a calendar girl and must say....I haven't aged a bit!!!!! I'm just as cute and humble as I ever was....The last statement lets me sleep very good at night. I guess I haven't updated my portfolio in a while but will be glad to send you a 8X10 glossy after my total and complete body lift is financed. Love checking in with the Minonktalk web site---brings back alot of old and favorite memories of my home away from home. Minonktalk is "Warm and fuzzy"
In summary, thanks. . . hoping you will have a change of heart and keep up the good work! Editor's reply: Carol, as General McArthur said, I shall return. But please don't equate McArthur's ego with mine. Thanks for the kind words. Fourth of July in Westside Park was always a highlight of my summer, since I lived and grew up on the other side of Dana (in the country), it gave me a chance to see many of my school friends that I hadn't seen since school let out. Somehow or other, I missed out on those mal-t-cups at Princess, though. I just wanted to compliment you on your Web site. Well done! I'm not from Minonk, but my aunt (Mernie Milashoski) lives there and my mother (Peanie Robbins) is there visiting for a couple of months. My mother told me about your site, and I've really enjoyed reading it. I'm a writer, and I appreciate how hard it is to do what you do. While our politics are very different, I respect anyone who takes the time to express themselves. Just thought you might like to know you have a fan in South Carolina. PS If you want to see some of my work, visit www.scvotersforcleanelections.com/point/. These are the archives of an alternative newspaper I published for 10 years.